Just look at this doodle. It looks like a lot of stuff doesn't it? Almost too much to process? Yes, that's exactly where I'd landed when I realized that this was the very point. Every day I'm bombarded by sensory input and it's a gigantic soup of experience. Life buzzes, chirps, whizzes, and whirs and the only way to make sense of it all is to group, categorize, and name parts of the soup and call them Things. I need to understand that a part of the soup that we label BUS just might run me over if I step out in front of it. But it's not separate from the scenery and so the mind does its job of separating and pulling it apart... car, bus, motorcycle, street. None of it would be separated except through thought because from what I can see all of the images are just present in one large canvas. Sounds overlap and intrude on each other, but I can separate music from car horns. Look! See? I've just named them! Are there ever not things? I realize that when I'm daydreaming or lost in the world of thoughts about future or past, I can stare at the scenery or listen to the sounds for moments at a time without recognition of any specific thing at all. I literally think the things into existence. As soon as thought enters, things magically appear. You might even say that they 'manifest', though not in the way the new age books like to tell me they do. What separates things? What makes up the borders? Can we pluck a thing out of the scenery in front of us? If not, is it truly separate or is it thought about variation in observed qualities which makes it so? The next time you are watching television, look at the screen and see whether you can pluck an object from the scene. Are there objects existing inside the screen or is the image a seamless whole? What is it that makes it seem as though there are separate objects in the picture? Are they truly separated? Here's an excerpt from something I'd written the very first time I was asked what my moment of "seeing" looked like. Every time I read this, the AHA! comes back to me fresh and new, but more than that, the account is simple and direct, exactly as the act of seeing happened. To set this up, know that I'd been working on the inquiry by reading a forum which came before liberation unleashed but the idea was the same.... it consisted of dialogues between seekers and guides, though "dialogues" is not exactly accurate. That's because the guides had distilled the message or pointer to "Just Look". The directive became my mantra and two weeks after finding the forum, "it" happened. Last Sunday after a couple of weeks of reading (yet more new) posts on this [Ruthless Truth] site, then finding the exercises on no-self.com, I dropped all the assumptions and spiritual "knowledge" and just looked. Plain and simple. Yes, I saw my computer monitor. I saw my lamp... the mouse, the pen, the windows, sheets of paper, legs, arms, fingers, and became annoyed by a film of the tiniest specks of dust. Then I looked for the smallest evidence of a tangible Me. That's when it first hit. How was is possible to see a single speck of dust more clearly than I could see a Me? Where the hell was I? And if I wasn't able to find myself RIGHT THERE WHERE I THOUGHT I WAS SITTING, then WHERE COULD I POSSIBLY BE? It's plain and simple. 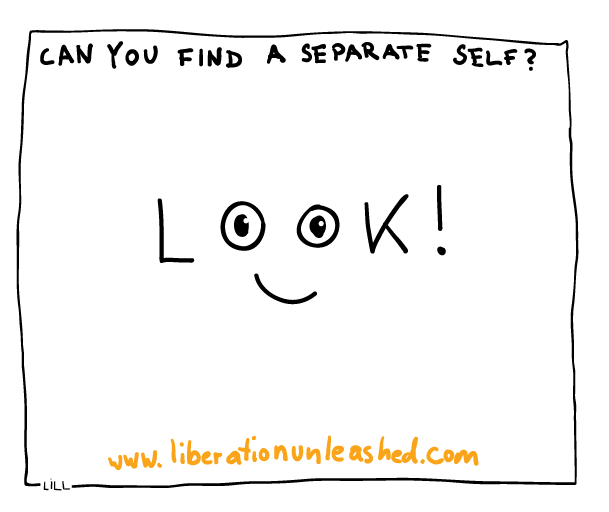 Look for the Me, the Myself, the Self, the Doer, the Thinker, the Seer, the Hearer and you'll not even be able to find something less than those specks of dust piling up on the printer. That was it. And every time I do a new inquiry, I follow the same strategy and distill it down to "just looking". This inquiry seems fresh every time I work with it. That's because when I really GROK this one, it becomes pretty evident that the story happening in my head is somehow able to completely override or REPLACE reality as-it-is. The panel on the left always seems to reflect the truth of what happens when I smell a flower. It's a great depiction except for one major flaw! If I run outside right now to smell the about-to-bloom magnolias on the scrawny and newly planted tree in my front yard, the reality is that the event is actually going to be experienced as the panel on the right. When I tell you the story of how things happened when picking up the magnolia and taking a good strong whiff, the panel on the left is truer to the story. It IS the story. The contrast between the panels becomes clear but the results leave me with a strange dilemma... the left tells a fictitious story that was never my experience at all while the right, even when truer, just doesn't work in the way we usually communicate. 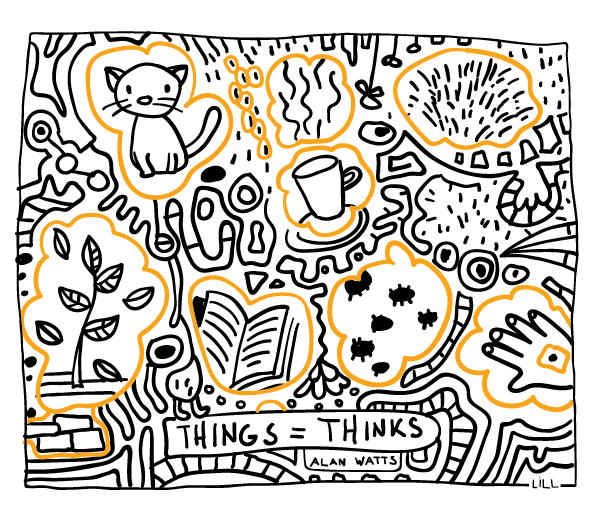 Ok, so now I understand what a doodle is supposed to do... tell a story. No wonder they're always drawn like the one on the left. They're not really accurate at all, though! Care to go down a rabbit hole with me on this one? After more inquiry, I found that both panels can only ever represent thought, and it's thought twice-removed. That's because there is the scent happening, and there is sight, but only thought has said those are the experience of a rose. Only thought says there is a thing called scent and only thought says there is a sight called "red", "flower"....... All I ever really experience is... !!! I'll let you know whether I make it back from this one. 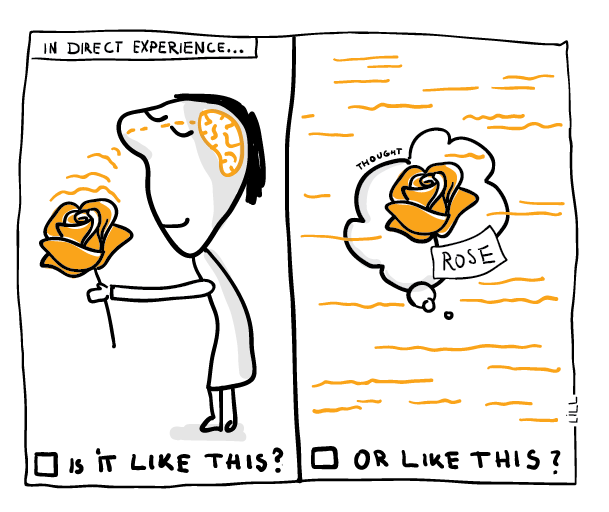 Which of the two panels is the image that usually comes to mind when thinking about the experience of "I smell a flower"? Is the panel on the left a true representation of what the experience of SMELLING, ITSELF looks like from your point of view, or is the panel on the right more accurate? How does understanding the difference between the two feel? How does seeing the difference feel? Notice all of the differences between the story we tell ourselves about an action, and the action itself. When looking out at the view, do eyes see an image of you looking at the view, or is there just the view? Where do "you" live... on the panel on the left or the one on the right? This inquiry is a sort of follow up to the question of Peacocks found here, but it can certainly be done solo. It's an amazing exercise. 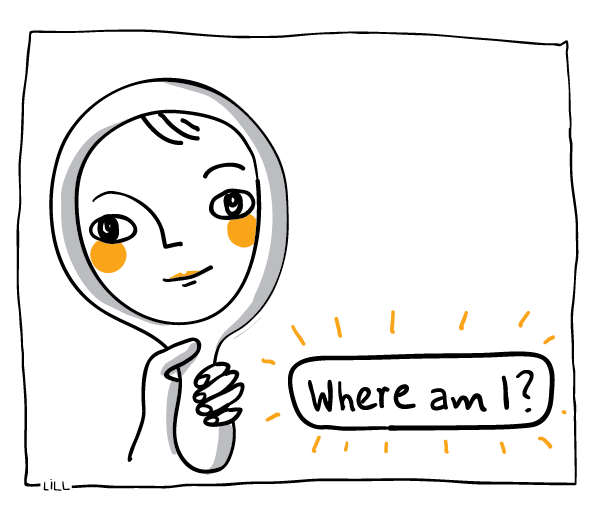 Though I've done this work before I keep returning to it because I never get tired of of looking at the questions. It's a lot of fun to examine sensory input such as sound because once you dive in, your previously hard and fixed view of how it's experienced can dramatically shift. What often results is the finding that we live in a world filtered by layers of rigid assumptions. To see this brings a sense of playfulness and ease which can open us up to a more unexpected and wonder-filled world view. Where is the border between me and sound? When looking at this question, the first thing I find myself trying to imagine is what's meant by the word "border". Obviously, it can't be a line or edge, because sound doesn't come to me by passing through a border as though it required a passport for entry. Nope. Sound seems to 'find' me whether I want it or not, as evidenced by the fact that right now I find the dialogue coming from my television set to be a whole lot louder than I'd like. If there was a border, I'd make it stop before entering my hearing space. So no, I can't turn away a sound. It's here, and heard, and doesn't care about my wishes or opinions on its existence. 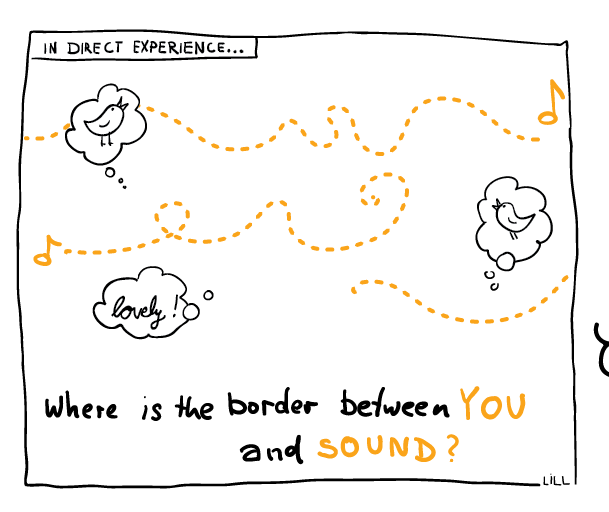 Besides, I've never heard of a border between me and sound, so this one seems straightforward. That was pretty easy, so let's push a bit more and take it further. What does it mean to find that there is no filter or border? Doesn't the lack of a line or demarcation dissolve the idea of there being a me AND a sound? Does the evidence show two things interacting, or does it show just one? Listening..... There's dialogue from the TV. But I can't hear a me HEARING the sound. There isn't a hearer running interference between the act of hearing and what's being heard. The dialogue is happening, and the sound is immediately just here without any interruption. I can't find three things... hearer, hearing, and heard. Sound just appears. Out of nowhere... thin air. Those are all words used to tell a story about a single event without borders. There was simply, Ding! Though to be able to tell you what happened I'd need to express it in a way which suggests that there were multiple parts and players (nouns and verbs), the truth is that the reality of experience is completely collapsed into just the raw happening, the.... Ding! Is that what's meant by One-ness? When a sound appears, check for the existence of a filter or barrier between the sound and the ear. Does the ear need to work to hear the sound or is the sound simply there, experienced effortlessly. Try to actively block a sound from being heard. Look for the boundary or blocking point between what is heard and the hearer. Is there any way to stop the sound from being heard by placing a wall in front of it? 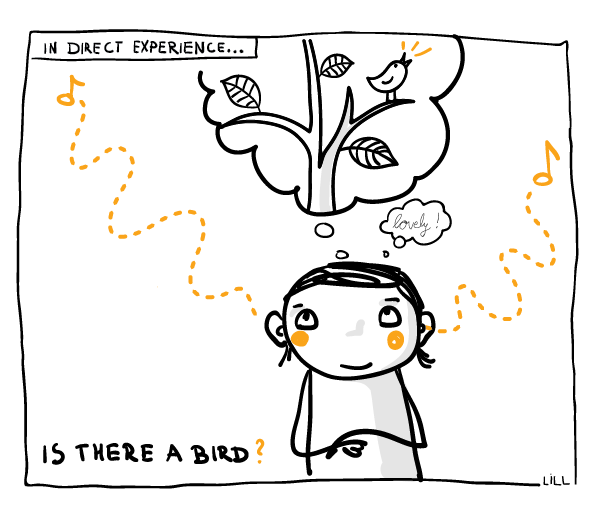 This doodle is one of my favorites, possibly because it involves trees and birds, or because the sound of a bird is so distinct and clear that using it for inquiry is easy. Or at least it should be! There are plenty of birds around to help me with this one, including the peacocks caw-caw-ing loudly a few houses away. The sound is sharp and draws my attention. I notice that the word "bird" doesn't even comes to mind because the image that pops right up is a generic one that signifies Peacock. Hmm... Ok, so the first thing I note is that there is absolutely no reason for the symbol for a peacock to come to mind except for a learned association. There is nothing about the noise that would convey, to someone who has never even heard of a peacock, "huge iridescent feathers, large plume, or lovely shades of blue". As a matter of fact, there's nothing in the auditory sense experience that would even say "bird". This has to mean that somewhere along the way, that image in my mind is an entirely Pavlovian response. But it's so strong that I'm having a hard time shaking it. It takes effort to do this inquiry and to see the truth of things, and even when I do, it's really pretty weird to try to reconcile. But I want to dig deeper. So, let's dig. I need an answer I can stake the farm on. Is there a bird at all? Remembering that this inquiry is supposed to take me back prior to knowledge, and that this question should be examined in terms as simple and direct as possible, I have to admit that there is no bird inside this sound. There is only the experience I call sound. There isn't a shred of evidence that I'm not hearing a cat, radio, screeching children, or anything else. The best I can say is that I BELIEVE there's a bird somewhere but all I really know for certain is that there's just sound! There isn't anything "making" it. Is there both a sound and a bird, or just the sound? Does the bird travel inside or on top of the sound? Where is the bird? Close your eyes and listen to the sound of a plane or bird. In that moment, with closed eyes, where is the plane or bird? Is it in the ears or is there sound simply appearing without location. Is the bird or plane there in the view or does the image come up in imagination only? If, in addition to hearing the sound you can see the bird or plane, what connects the sound and the image? Are they connected through thought and imagination or is there an actual physical connection there? Is there a tether, string, or chord? Is thought the ‘connector’? Can a sound (chirp) be seen (image)?